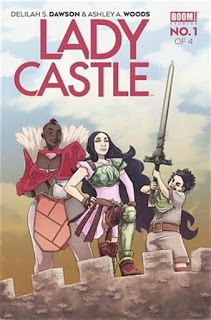 The Fellowship was fortunate enough to obtain a copy of LADYCASTLE #1 from BOOM! Studios. Delilah S. Dawson writes, Ashley A. Woods draws and colors, and Jim Campbell letters. Princess Aeve refused to marry, and so she’s locked in the tower. So King Mancastle roams the land to find a suitor Aeve will accept. But now a dragon has attacked his party, killing all of the castle’s men. The women are fine with stepping up to run the castle, but there’s a catch – the castle is now a monster attractor. So the women must also learn to fight, and Aeve is proving to be a natural fighter as well as problem solver. This story is loaded with great characters and interactions between them. After six years in the tower, Aeve might not be quite right. Merinor is proving to be a wise king already. And Gwyneff is a little sister in many senses of the term. This is just a fantastic beginning for a well-grounded fantasy story. And the art rests very comfortably somewhere between high fantasy and anime, with a color scheme that adds a layer of emotion to the book. Ever had the feeling that you should be doing something else, somewhere else? We all have, and this book is a wonderful expression of the idea, showing how sometimes our strength can come in ways we couldn’t imagine. LADYCASTLE #1 is available now at your local comic shop or at boom-studios.com.